Photo by Jason Marak Jack Sewell, here building his sculpture, hopes to put a bird (back) on it. The past year was a rough one for public art in these parts. The summer months saw at least three public sculptures destroyed by vandalism. Those artworks, installed at Eureka's C Street Market Square by Humboldt-based sculptors Robert Benson, Malia Penhall, and Benjamin Funke, were either lost or damaged beyond repair. Now "Following Current Events," a permanent sculptural installation at the same site by Eureka sculptor and retired gallerist Jack Sewell, has sustained major damage for the third time in its three years of public display. Sewell's work was, and is, light-boned and open to the elements. The kinetic sculpture on the waterfront still looks like a thrifty, gracile drawing linking bay and sky. A slim steel band rises high above the ground in a sail-shaped arc; traceries of tensile stainless steel connect points on the arc's perimeter. Set in a shallow pool, the sculpture swings and vibrates in response to ambient currents. 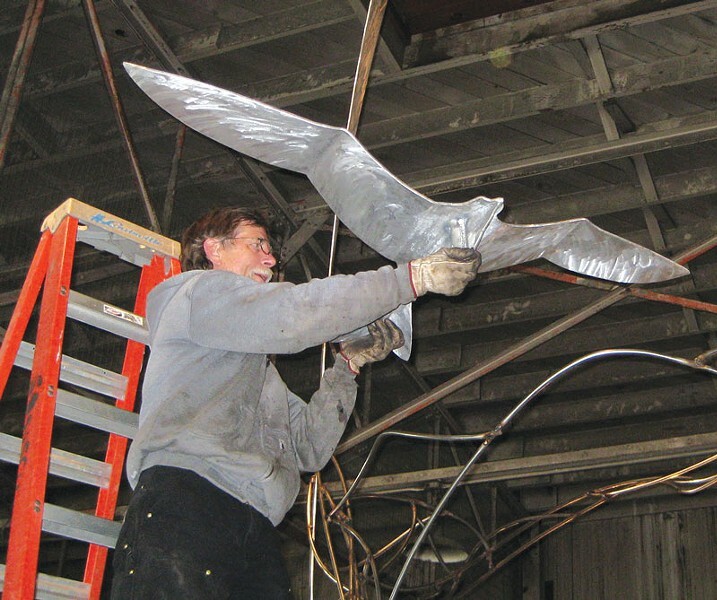 Originally the sculpture featured three gull-shaped forms — soaring bird silhouettes with arcing 5-foot wingspans, fabricated from ¼-inch aluminum. Early this December, the sculpture was damaged when one of these aluminum birds was wrenched from its setting and stolen in an act that Sewell said must have taken "considerable force and effort." The sculpture was not under video surveillance, and the identity of the perpetrator(s?) remains unknown. Even exactly when the damage occurred is unclear. Sewell originally imagined the piece as a gauge showing ripples in the air, water and time. However, it's had unanticipated success as a vandal-magnet and an effective barometer of social mores, albeit one that only responds to negative stimuli. Since 2012, Sewell has made multiple repairs due to participant-viewers who were either unable or unwilling to appreciate the distinction between a work of public art and a jungle gym. Illicit climbers bent part of the structure nearly in half and then mangled one of the birds in an unsuccessful attempt to twist off its wings. The sculpture belongs to the city but Sewell volunteered his time to twist and weld it back into shape after each of these events. And "Following Current Events" survived these insults, remaining in one piece until this December. In retrospect, it's no small achievement. In August, Robert Benson's 2015 redwood sculpture "Undam the Klamath" suffered an arguably worse fate when it was uprooted from its temporary site at C Street Market Square, never to be seen again. Benson said the massive sculpture had been secured to the metal plate at its base by 8-inch lug screws. No one knows what happened, but Benson pictures a waterfront miscreant uprooting the sculpture by wrapping his (or her?) arms around it and hauling forcefully upwards, stripping the screws before hurling the piece into the bay. Imagination conjures the comitragic scene: a nocturnal, perhaps solo, almost certainly far-from-sober endeavor in which human pathos mingles with the spirit of brute mayhem. It's like an outtake from Idiocracy, a Jesse Wiedel painting or a homegrown variant on the ancient Scottish game of caber tossing that hints at the unique flavor of nightlife in this Victorian seaport. After protracted insurance negotiations, Benson recouped his financial loss. But it was hard to shake the negative sensations the event engendered. "I felt like I was being Good Bob, my best self," Benson explained, "putting something out there in the community for others to experience ... and then getting blindsided by this bad karma." "My fantasy outcome," Benson confided, "is that one day I'll be walking along the shore and it will just wash up in front of me. Of course, it's going to look different. It's going to be altered by the experience." It's easy to envision "Undam the Klamath" complicated by sea change: enlivened by algae, starfish and anemones, hosting multitudes. You've got to be motivated by a degree of altruism to want to commit art to such an environment, knowing the risks. Perhaps as a result, local artists who've lost works to vandalism tend to be philosophical about the loss, with attitudes ranging from zen calm and stoic resignation to a kind of existential acceptance tinged with anger. And yet public art has never been more in demand. As Sewell points out, community engagement continues to trend in both civic and artistic circles. "It seems like every small and mid-size city in the nation has launched a public art program," he said, adding that he has recently received dozens of invitations to contribute sculpture to civic spaces nationwide. "Actually I have been surprised at how much respect we show public art in Eureka, on the whole," Linda Wise commented. 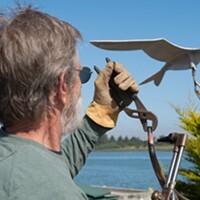 Wise is president of the Redwood Art Association and a board member of Eureka Main Street, which, along with the Ink People Center for the Arts, shares responsibility for the rotating public sculpture program at C Street Square. One of her sculptures has been on display there for more than a year, and — knock on wood — it remains intact. Wise added that the city's many murals have experienced remarkably few problems with vandalism and that vandalism seems mostly confined to the sculptural works on the waterfront. Charlotte McDonald, director of Eureka Main Street, believes that the recent depredations are most likely isolated occurrences. "This rash of incidents has been discouraging to me, and it's certainly a departure from the norm," she said. McDonald said the incidents may be related to the substantial uptick in property crime reported this past year by the Eureka Police Department. She speculated whether this might be in turn connected to the 2014 passage of Proposition 47, a California law that changed some low level crimes like drug possession and petty-theft from potential felonies to misdemeanors. One obvious short-term approach to dealing with the problem would be to mount security cameras to make sure all sculptures are under surveillance. "Certainly, the question of cameras has come up before," McDonald said. "But, frankly, I don't know whether mounting camera would be a deterrent or not." Eureka Main Street has discussed the possibility of installing cameras with members of the Eureka Police Department, and McDonald said the organization recently submitted a grant application to pay for cameras. However, she said, for now Eureka Main Street "is financially not in a position to do that." McDonald believes that the way to make positive change in the long term is to improve education. She worries that lack of funding in local schools, along with economic stagnation and the high poverty rate, have contributed to narrow children's experience. "When I was growing up, art was part of my life, part of my education," McDonald said. "I worry that, now, many kids in our area don't have as much access to that. I think the more we see creativity as a positive outlet for energy, the more we'll be able to overcome a lot of our social problems." Wise agrees. "The mere presence of public art does something to create a more cohesive community," she said. "When you have art in a public space, it shows that people care about the place, and about each other." If you happen to spot the missing metal bird or sculpture, call Charlotte McDonald of Eureka Main Street at 442-9054.